The Gnome Games will be an afternoon of fun and of course games . Back due to popular demand this event was started to facilitate friendly rivalry between the Cheshire Gnome Trust and the Wirral Gnome Society gnome organisations rather than risking more bloody rivalry as occurred at GNOMEAGEDON (documented by SirPhilPamAndRob). The winning group will win The Ashes (the remains of the first Gnome King's pointy hat). The afternoon will kick off with procession of the team flags, led by the respective leaders. Then each person present will have the opportunity to register their times and distances for each event to determine who will represent each team in the finals. The North Wales UK Mega and Maze Team will be providing a selection of refreshments, stalls, a tombola, face painting, scarecrow making, and much more giving it a summer fair feeling. At the time of publication there are 2 confirmed Gnome teams, Wirral and Cheshire. If other county Gnome teams wish to register then please contact us with the name of your county team name, the nominated representative for the day and what colour you will be competing in. Please note that red, blue and yellow are already allocated. When you register your "will attend" please confirm your allegiance to a team. Wirral will be competing in red, Cheshire will be competing in blue and "rest of the world" in yellow. As with all geocaching you take full responsibility for your own safety. 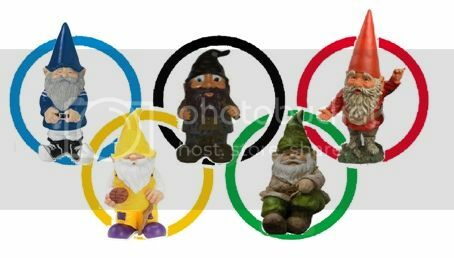 This event is a bit of fun and is not a serious competition (its for the gnomes which are of course serious but you are not a gnome so it can't be serious). You do not need to take part in the games to log an attend, just come along to watch the fun and enjoy the stalls. The Games are to be held at: Elm Cottage Touring Park, Chester Lane, Near Winsford, Cheshire, CW7 2QJ (http://www.elmcottage.co.uk/) where we have full use of the rally field. We will be camping from Friday 27th May to Monday 30th May. Please contact the site directly to book your camping.